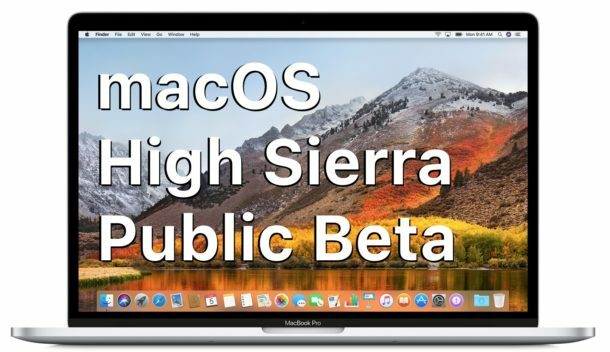 MacOS High Sierra Public Beta is now available to download and install for any user who is interested in beta testing the system software. However, be forewarned that beta system software is notoriously less stable and unreliable compared to final versions, and is thus not suited for primary hardware or critical workstations for the vast majority of Mac users. Beta software is most appropriate for advanced users, enthusiasts, developers, designers, and early adopters. When I download the public beta for High Sierra the “Install macOS High Sierra Beta.app” app is 11MB and does not contain the InstallESD.dmg file that is used to initiate createinstallmedia and a boot drive. Does anyone have a solution to this with the Mac OS High Sierra Public Beta that does not involve installing the dev channel? Download macOS High Sierra installer again, it is about 4.8 GB. Remove the current installer and download it again, you will need the full installer to access createinstallmedia and to install without internet access. That link goes to the 14MB downloader. I can’t find a way to download the full installer. 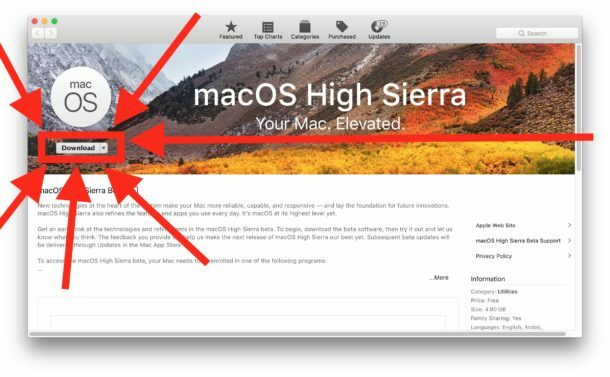 Some users are getting an 8MB or 14MB version of the MacOS High Sierra installer, and some users are getting the full version which is about 5GB. I don’t know why there is a difference between the two, and there is no answer on the web either. You might want to try deleting High Sierra Beta Installer from the Mac and then re-downloading it again. Terrible performance so far, functional failures in core components such as iCloud, Siri, and Safari. Yes it’s a beta, but it’s the public beta which means basic functional issues should not be an issue. I’ve spent major time with most of the previous macOS betas and this is by far the worst I’ve seen as a public beta. Testing on 4 different Mac products currently, MacBook Pro Retina, MacBook Air (i7), iMac, and 2013 Mac Pro. Running on clean partitions. Eagerly awaiting the next update. Same here. Initial install attempt bricked my iMac. Did internet recovery, then tried again and it works, but all kinds of stuff crashes (safari, Photos etc.) and hangs or doesn’t work at all such as backups to a time capsule. not a huge deal, but I think the general trend at apple is QC is trending down. What do you make of that DCJ001? Do you deny the will of the Supreme Apple Guru Gruber? Shall you disobey the Great Gruber and capitalize it as macOS or shall you use proper capitalization for a name and use MacOS? One of many great Apple zealot conundrums! What will you do? I ran it for a few days, seemed pretty good, but ESET anti virus won’t run (self imposed by them) and Clean My Mac doesn’t run, said it won’t run on 10.13 or above ever. So, overall most things worked well. The install went clean. I would have stuck with it but the Co I work for requires the AV. Can’t install: The installer information on the recovery server is damages. Downloaded it again and the same message. Also a third time, the same message. I had created a separate partition on my Mac called BETA. Then installed original Sierra on BETA partition. Then installed new Public Beta of High Sierra on BETA. I never saw the option to use APFS. So I then used Disk Utility to to Convert to APFS. Following this process, I could not boot to the BETA partition. I had to get some Terminal commands from another site to delete the volume. I have since recreated BETA, installed High Sierra. Still never saw the check box for installing as APFS. Any ideas? “Functional” and “Fully Functional” are two different things. This is more like an Alpha than a Beta. I cannot get the installer to work. Tried it on two different partitions of an external (non-primary) hard drive. First got a message that the installer failed because of some weirdness with resizing and HFS+. I tried again, and now I’ve got installer pieces stuck in the trash that I can’t delete due to “system integrity protection.” Not impressed that the installer itself is a bomb and now I’ve got files I can’t easily delete taking up almost a GB of space in the Trash. Workaround, anyone? I’m not going even attempt the public beta again, as I’ve not had any major issues with any of the public betas since joining the program. . .until this one. as far i can see after Capitan, there is NOTHING for neither audio or video-work in these “updates”, only worse performance. so what is the point in updating then? Have tried on two different Macs to run Developer Beta Access Utiilty for macOS High Sierra 10.13 beta 4. When AppStore comes up, it does not show High Sierra download. It only shows Safari 11.0 Seed 3 as available for update. I cannot download the High Sierra Beta.